Mark: A lot of my time in Los Angeles has been spent in and around the improv comedy community, and watching a seemingly endless amount of bad comedy (and, truly, few things will make your flesh want to flee your body more than bad improv) really makes you appreciate the pros — people who week after week are able to deliver a baseline solid, occasionally brilliant, show. Consistency is what makes a pro a pro, in comedy, sports, comic books, what have you. The ability to reliably deliver the goods is indispensable. Superman 16 is a slightly disappointing end to Patrick Gleason and Peter J. Tomasi’s “Multiplicty” arc, but they’re pros, so even a messier Superman has ideas and moments worth paying attention to. For instance, I like the idea of Red Racer pushing himself to the limit to build the Musical Engine Thule, even if I don’t entirely understand why it destroys him. I like that Ray is able to construct something that should take a thousand years in a matter of moments, but doesn’t it seem like he would be able to round up the designs and gather all of the materials faster than Green Lantern and Machinehead? Thus is the problem writing a character who uses the Speed Force. And I love the image of Superman cast into the mass grave, surrounded by the other Superbeings whose powers Prophecy has already consumed. There’s something perfectly pulp about the moniker “The Grave of Supermen,” and the art team captures that action serial energy with Superman’s dramatic pose and dark shadows. Across the board the art by *DEEP BREATH* Tony S. Daniel, Clay Mann, Sanu Florea, Seth Mann, and Dinei Ribeiro is outstanding. One of the areas in which Gleason and Tomasi consistently excel is leaning into Superman’s fundamental heroic good. I’ve come to expect at least one Superman rallying speech per arc, and the creative team doesn’t disappoint with Superman’s appeal to his fellow Superpeople. One thought, are we to consider this Superman to be the best Superman? He says they’re all created equal, but he’s definitely the leader in this situation and the one who comes up with the plan that defeats Prophecy. Generally, Superman 16 feels rushed, and the issue suffers from having to time after time wave away explanations for why things happen. I already mentioned confusion over why Red Racer dies after completing his task. But not only is his cause of death “explained” by a throwaway line, his heroic death is pretty quickly passed by. Like, I get he’s only Red Racer and a member of the throw-away Justice League Incarnate, but dude just Barry-Allen-in-Crisis-on-Infinite-Earths‘d himself because Superman needed him too. Use what against him? His hand? Stop-hitting-yourself style? Of course when they do take off his hand…somehow…Prophecy is now powerless because, as you recall, all of “[their] power” was in his hand. I guess it’s internally consistent, even if the rules are never established with any clarity. What’d you think, Michael? I admit to being a little disappointed because this arc started out with so much promise. The reveal at the end that Mr. Oz is the big bad Prophecy was trying to prevent is potentially interesting given the events of the broader Rebirth universe, but is also annoying because a potentially interesting story was stymied in order to feed a larger narrative that we probably won’t be getting satisfying answers to for months (years?) yet. Michael: Mark, one of these days all of us Retcon Punch comedy types will have to do an “Improvised Alternating Current.” I’m right there with you in your assessment of Superman 16 however; it was a rushed finale to be sure. I was equally frustrated with the issue’s resolution and how Team Superman overcame Prophecy with relative ease. Prophecy himself was just as confused as to how they got their powers back as we were – possibly a meta read on how the readers would feel? Grant Morrison’s Multiversity spoke to us in a meta-textual language, so it wouldn’t be a complete surprise that Tomasi and Gleason would use that method here. “Multiplicity” isn’t exactly a sequel to Multiversity but somewhat of a spinoff. The characters and internal logic of “Multiplicity” are basically the same as they were in Multiversity, leading me to make some leaps in logic and associations that might not be there. A large thematic element of Multiversity was “the empty hand” which simultaneously served as the famous image of DCU creation and the meta symbol for the publisher’s hand, whom we give our money. 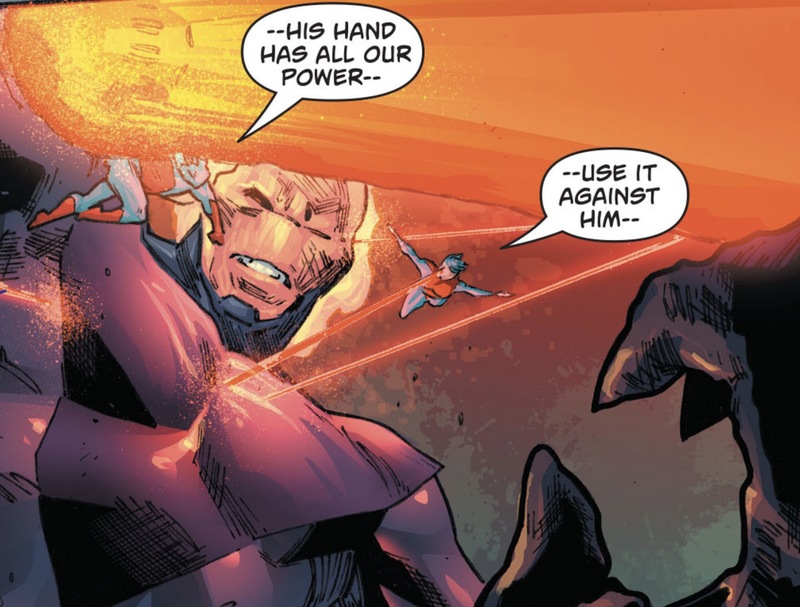 The Supermen spout off about how Prophecy’s hand had all of their power, which made me think of that empty hand. Like I said, it’s a leap but it seems like too much of an echo to be mere coincidence. Speaking of echoes, let’s talk about the magic of music of The Ultima Thule. 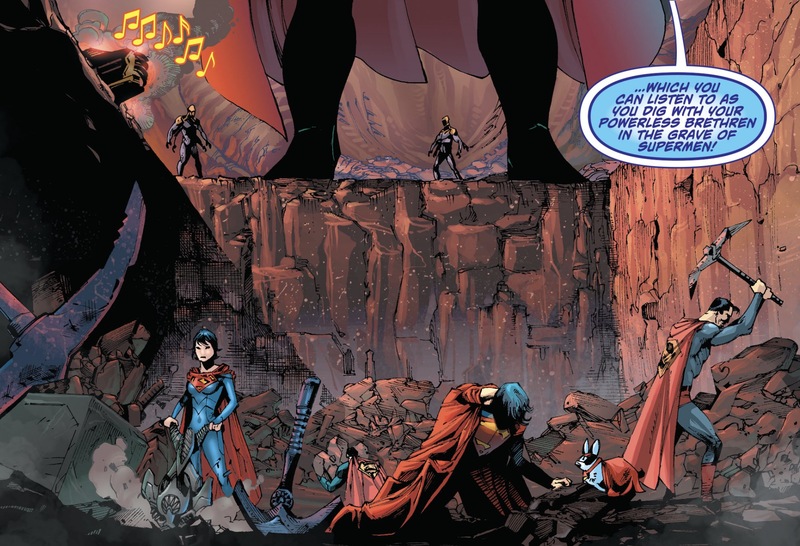 In Multiversity, Morrison discusses how music plays into the vibrational aspect of The Multiverse in a comic book scientific way that only Morrison can do – in Final Crisis Superman basically killed Darkseid by singing a super note. Though it’s not explained outright, that “musical science” still holds up for the most part in Superman 16. 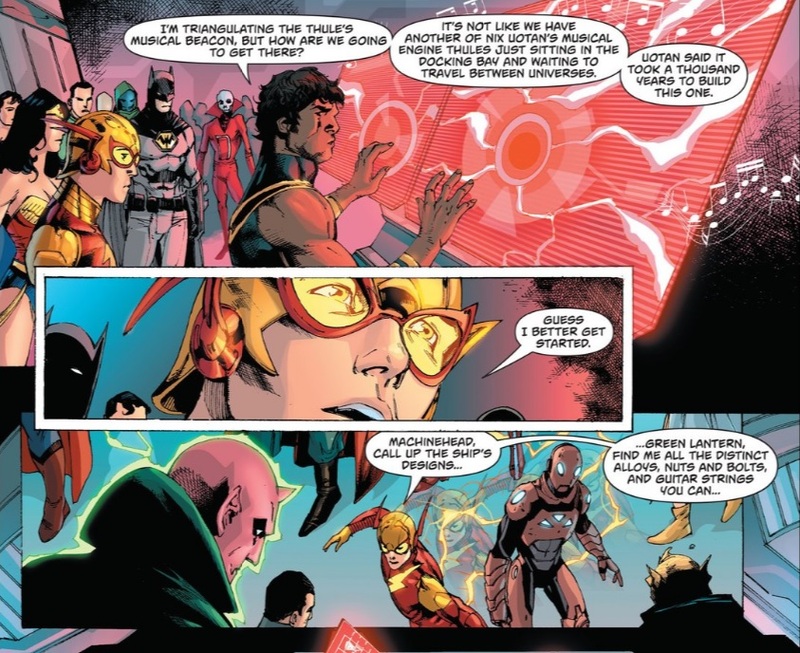 The Justice League Incarnate pinpoints The Ultima Thule’s location by way of its musical homing beacon and the engine that Red Racer dies constructing allows them to travel through The Multiverse by way of musical vibration. As The Ultima Thule 2.0 arrives to save the day, President Superman and the rest of the Justice League Incarnate Supers are glowing with blue energy, which seems to repower the ones that Prophecy had captured. Is it possible that the Multiversal music can also channel the power of a yellow sun? There’s a lot of shorthand here that I’m not sure you’d understand if you hadn’t ever read Multiversity. Mark and I were scratching our heads trying to figure out the logic of Superman 16, so I can’t imagine how someone foreign to Multiversity might have handled it. In their 16 issues (and one Annual) Pete Tomasi and Patrick Gleason have been working hard to reestablish Superman as a symbol of unabashed goodness and hope. Another theme that has been present throughout is the idea of this Superman as an anomaly – in fact, that Annual I mentioned focused almost entirely on that concept. Superman 16 opens with Prophecy restating this as he examines our anomalous Superman. Mark questioned whether or not our Superman is the best Superman, if all Supermen are indeed created equal. Maybe by Superman being an anomaly among the other Supermen he is the de facto best or maybe it disqualifies him completely. Clearly in a book called Superman the “best Superman” is going to be the one whose name is in the title – the platonic Superman. Superman is meant to inspire us, so in a cast of Supermen I suppose one Superman has to be THE Superman: the sacrificial Christ figure. Prophecy justifies his terrible actions by trying to save his universe from being destroyed (by Mr. Oz). Superman kind of laughs this off, saying that if he believes he’s the savior of the universe he’s destined to lose. What he should have said is that Prophecy is destined to lose if he believes that he’s the SOLE savior of the universe. Superman is old and wise enough to know that it takes more than just one (Super) man to save the day. Bearing that in mind, Kenan Kong’s place in all this makes a little more sense to me. If our Superman is the platonic Superman among a sea of Supermen who are all equals, it only makes sense that he’d impart wisdom to the newest Superman on the block. The elements of a great Superman story are present in Superman 16, it just probably could’ve used one more chapter. And there was the fact that the other important thing Red Racer did was subvert common thinking, as part of Morrison’s assault on restricted and limited ways of approaching superheroes (like… Rebirth). That’s why Red Racer had his ‘Flash always dies heroically in Crises’ moment, except the point was that he actually survived (which makes his death even more confusing than you guys apparently already are. Second hand, from what I heard, Red Racer just ran too fast, which is ludicrous considering how fast he ran in Multiversity – 52 universes in less than a moment). And then there was the fact that diversity was such a key theme of Multiversity that I’m pretty sure the first issue, setting up the main characters, lacked a single straight white man. To kill off a gay man in a story led by a straight white man is the antithesis of everything Multiversity represented. Why the hell would THAT be your Multiversity sequel/spinoff/whatever you call this?